If you have read this site for a while you know that I prefer northern style cornbread, but that I am also learning to enjoy southern style cornbread. 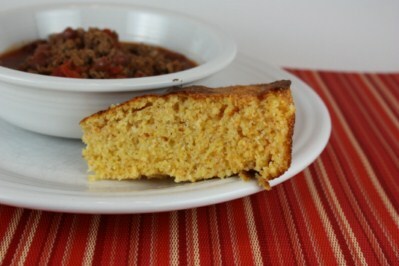 I have tried several different southern cornbread recipes, but this recipe has become my favorite. Why is this my favorite? Because it has bacon in it and bacon makes everything better, doesn’t it? 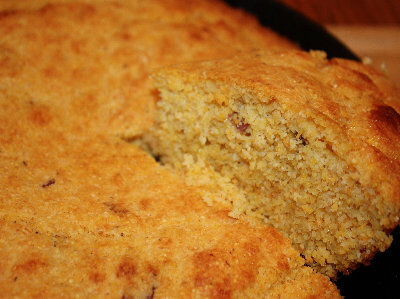 I like this cornbread mainly for the bacon, but it really does have great flavor and texture. This goes perfect with a bowl of chili, but it also goes well with a pot of beans for a simple meal. 1. Cook bacon in oven proof skillet ( I use cast iron) over medium heat until crisp, about 6-7 minutes. Transfer bacon to paper towel-lined plate. Pour off fat from pan, reserving a few tablespoons in pan for baking the cornbread. 2. Combine cornmeal, baking powder, baking soda, and salt in large bowl. Whisk in buttermilk, 1/4 cup oil, eggs, and crisp bacon. 3. Heat reserved bacon grease in empty skillet over medium-high heat until hot. You want a hot pan and hot grease. Spoon cornmeal mixture, about ½ cup at a time, into skillet and bake at 450 degrees until top begins to crack and sides are golden brown, about 13 to 16 minutes. Cool in pan 5 minutes, then turn out onto wire rack. That looks really good Lynn. I have never had cornbread with bacon in it, can you believe that? I guess I need to try it. Bacon makes anything better!! Can’t wait to try this one!! .-= Julie Anne´s last blog ..Taa Daa!!! I have an oven!!! =-. Love the picture of your skillet (?) cornbread. I like the sweeter (and moist) cornbread over the traditional dry cornbread…the bacon is a lovely twist and we’ll have to give your recipe a try in the future.